At Dental Excellence, we provide cosmetic dentistry in Independence, Missouri. We are excited to welcome new patients from the surrounding areas, including Blue Springs and Lee’s Summit. If you are looking for a high-quality dental office, we are here for you. With us, you can trust you are being treated by a team of professionals who look out for you. We are grateful for our patients, and we want them to have a healthy, long-lasting relationship with us. We know that each one of our patients is an individual with different needs and concerns. Every person is in a different place when it comes to dental health, and, as such, each person needs to be addressed with attention and care. We will work with you to create the healthy, happy smile you have always dreamed of. Our office in Independence provides a variety of cosmetic dentistry services. From teeth whitening options to full mouth reconstruction, we can address the problems and concerns you have and work with you to create that bright smile you will be proud to show off. One of the procedures we offer is dental inlays and onlays. This procedure can be a solution if you have damaged or cracked teeth. When is this procedure used? When over half of your tooth's biting surface has been damaged in some way, an inolay or onlay is often used to address the problem. 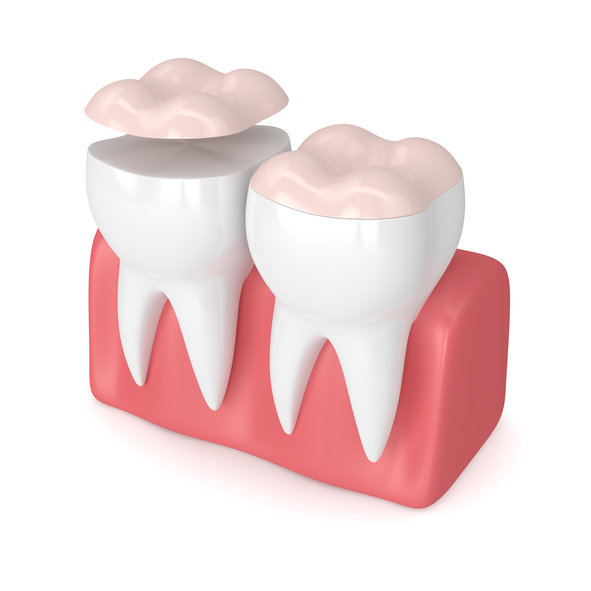 This procedure allows the damaged part of the tooth to be replaced with a durable, functional, and attractive substance. What is a dental inlay or onlay? Inlays are similar to fillings, and they are used on the inside cusp tips of a tooth or teeth. Onlays are a bit more extensive and are often used when there is more damage. Years back, inlays and onlays were made of gold. But, as dental technology has advanced in the modern age, they are now made with a durable porcelain or a composite resin. This is a great advantage as the materials used for inlays and onlays now match the appearance of your natural teeth. You won’t have to deal with an awkward material that stands out. The inlays and onlays we place will blend in well with your other teeth and create a beautiful, functional smile. If you have a damaged tooth, it can lead to many problems. First of all, you might be experiencing pain or discomfort that comes along with a damaged tooth. You might also have issues with chewing or eating which can be frustrating. Second, a damaged tooth can make you feel uncomfortable about your smile. There are many aesthetic reasons to receive an inlay or onlay. The newly fixed tooth often leads to a boost in self-confidence and self-esteem. If you find yourself hiding your smile because of a damaged tooth, an inlay or onlay can have you smiling happily again. An inlay or onlay will usually be placed in two appointments. The filling being replaced or the damaged part of the tooth will be removed. The tooth will then be prepared for the inlay or onlay to be put on. An impression of your tooth will be taken and sent for fabrication in the lab. We will then apply a sealant. The temporary sealant will be take off. We will make sure that the inlay or onlay is the correct fit, and we will make adjustments if needed. Once the fit is deemed satisfactory, we will bond the inlay or onlay to the tooth using a strong resin material. Then, we will polish the tooth for a smooth, beautiful appearance. Give Dental Excellence a call today if you feel you could benefit from an inlay or onlay. We will be happy to schedule an appointment at a time that works well for you. We can also answer any questions you have about the procedure.